On Feb. 12, 2018, the Centre for Women and Trans People hosted an event with the Sexual Assault Support Centre of Waterloo Region (SASC) called Consent Across Contexts. T.K. Pritchard, Male Allies educator for SASC, hosted the event which educated students and community members on the topic of consent as well as what consent can look like in many different contexts. In addition to conversations about sexual consent, Pritchard also educated the participants surrounding non-sexual consent such as greeting family members, consent about talking photos and uploading them online, play fighting and not being aggressive when it comes to asking folks out on dates or outings. “We were talking about consent across contexts, sexual consent, consent in long term relationships, as well as non-sexual consent,” Pritchard said. Pritchard described the purpose and importance of the event. 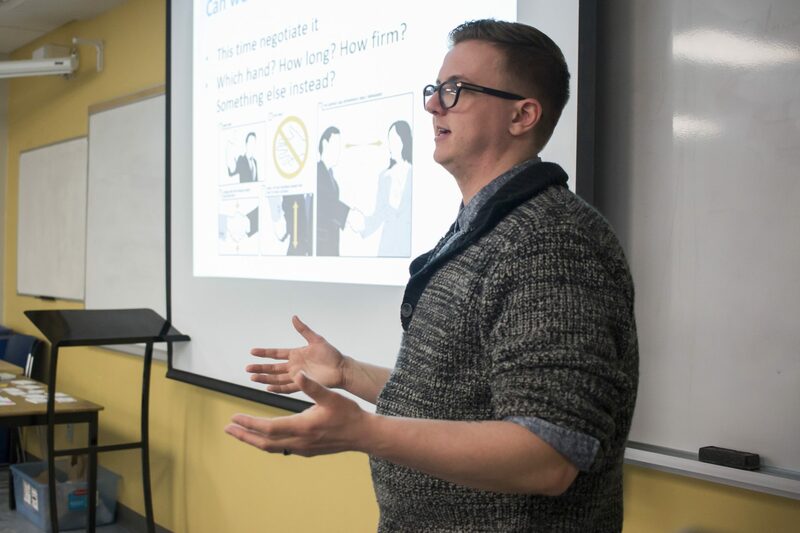 “The purpose of the event is to get people talking about consent and the basic idea of what it is, and the basic understanding of how we actually talk to partners about consent,” Pritchard said. Ultimately Pritchard provided insight on where to access additional resources, such as the Consent Castles, an online comic strip which educates the general public on consent, as well as blogs like Everyday Feminism. Some of the barriers of consent as discussed in the presentation include the assumption and lack of communication among individuals in relationships about what is allowed and what is not. Pritchard explained that constantly checking in with your partner or date to ensure certain actions are allowed is important to facilitating consent. A way that was described in the presentation to facilitate consent is to check in before, during and after sexual activity and talk about what events took place: what works and what doesn’t. Pritchard explained that there are various campaigns within the Laurier community and the KW community which students can reach out to in order to educate themselves on consent. “There’s some campaigns on campus like Consent is Golden, Not My Laurier, as well as the sexual violence response coordinator’s office,” Pritchard said.